Career planning isn’t an exact science, and you might find yourself in a very different role than the one you’d originally planned for. Carly Sharples’s (@carlysharples) original plan was ‘reading stories to children as often as I could’. Instead, she’s an Academic Liaison Librarian with responsibility for seven faculties. In this post she talks about getting to grips with her role, and how library school helped to prepare her. Well if you’d told me when I started library school that three years later I’d be an Academic Librarian responsible for seven faculties I would certainly not have believed you. Yet here I am! I started library school with the express intention of working in public libraries and reading stories to children as often as I could. So what happened? How did I suddenly find myself on a baking hot July day, starting work as a Faculty Librarian at UEA? I did not have too long to ponder this question, as my brain was soon swirling with names, faces, acronyms, numbers and staircases as I tried desperately to remember everything everyone was telling me. I discovered that I already had 40 emails waiting for me in my inbox, piles of donated books waiting on my desk, and plenty of paperwork to read and digest. These were my challenges: I had to find a way to quickly learn which resources were available for all my subjects and how to use them, liaise with faculties over their induction requirements for the new year (yep – the diary was already looking pretty scary), get my head around the Library of Congress classification system having been a Dewey girl all my life, start getting to grips with the collections and placing orders for books, and I needed to check if any schools wanted to cancel any journal titles in order to take up a new journal subscription. It’s fair to say at the end of the first day I was feeling a tad overwhelmed! It sounds like a lot, but I suppose the key thing with any new post is to take your own approach and bide your time. It was clear from the outset that my biggest challenge would be adjusting to the sheer scale of the role. My previous post had been as a subject librarian, dealing with just one school and developing subject resources for just those students. It’s taken me the whole of my first month to understand that while my new role is made up of the same elements, it is not the same job at all, and I have to take a much broader view which fits my remit and can allow me to set realistic and expectations of what I can achieve. This realisation is not without its frustrations, as much of the subject-specific support I would ideally like to provide I just do not have the time for, and a lot more of my time than I thought is devoted to devising compromises with academics regarding which library resources we can buy within the library budget! Nevertheless, my priority remains the provision of an excellent library service, and if I’ve learned anything over the course of my career so far, it’s that this provision takes many guises. Would I be able to do this without library school? I doubt it very much. A lot of the content covered in my MSc I have drawn heavily on when trying to get up to speed with subject information (in particular business and law). I’ve also drawn on skills I’ve gained throughout my library career so far, including presentation skills, knowledge of LMS and discovery systems, reference management systems, and just how to get along with so many new people! It’s surprising how many little things you thought you’d never need to know again you’re suddenly very grateful for a bit further down the line. I think one of the most challenging aspects of being a faculty or subject librarian is the fact that, while you are a member of a team and have support from your colleagues around you, you are also quite alone in that it’s down to you to choose how to prioritise your workload, what you can or can’t manage in terms of teaching for each school and just how much support you can realistically offer while getting the day to day emails and admin done as well. 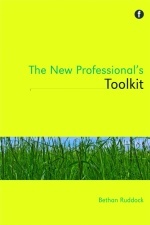 I’d encourage any new professional finding their way in this environment to continually challenge this tendency toward creating your own bubble, and work collaboratively with others as much as possible – especially all the other library staff who aren’t new and therefore know so much more than you and can help you! This isn’t always easy, and as my day-to-day activities revolve around interactions with student and academics, it has been hard to get to know the other library staff and build a relationship with them, but I am continuing to make the effort to get to know everyone. I can’t say my first month has been constant fun – there are fun elements, but I’ve also been quite anxious starting a new role which is so much larger than anything I’ve ever undertaken before. I’ve continually reminded myself that I’m new and that I can’t know everything at once, and with the support of my colleagues and a few deep breaths every now and again I’ve made it through my first month still feeling reasonably capable, which I think is an achievement in itself! I still consider myself a new professional with plenty to learn and more confidence to build, but perhaps I’m now a little less new, a bit more experienced, and have plenty more challenges to look forward to.